Executive Director of the CIMA, Sri Lanka Division, Mr.Upali Ratnayake, President of the CCITD, Mr. K.Thurairajah, and Secretary of the CCITD, Mr.R.Rajarammohan, signed the memorandum. According to the MoU, both parties would support and co-ordinate organizing seminars and workshops for students and chamber members in the Trincomalee district, sources said. CCITD officials announced at the event that CCITD has agreed to open a Business College in Trincomalee to overcome the dearth for professionally qualified personnel in the field of management and accountancy in the district. Mr. Rajarammohan said the co-operation between the private and public sector is vital for the development of the country. The formation of the Chamber of Commerce and Industries has given a boost to the private sector development of the district. The opening of the CIMA desk in Trincomalee would certainly help the youths of the area who did not get the opportunity to enter universities for higher education to follow professional courses, he said. CCITD Vice Chairman, Mr. P.Wickremanayagam, said the need for a Business College in Trincomalee is a long felt one. A Business College has dual role to play in the development. The first role is to provide opportunity to youths who did not get into the university to follow professional courses in Management, Marketing, Information Technology, Personnel management, Banking and other relevant fields. The second is to meet the demand for professionally qualified persons in the management and accountancy fields. CIMA Executive Director, Mr.Upali Ratnayake, said youths in the Trincomalee district had been deprived for the last twenty years the opportunity to obtain professional qualification in their soil. 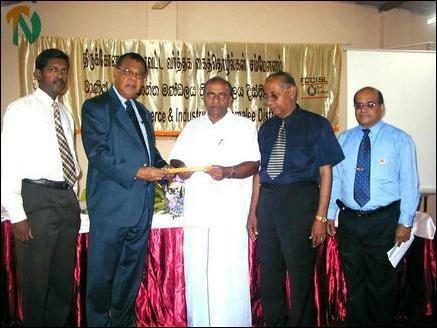 "Now the CIMA's Sri Lanka Division has taken steps bring the Trincomalee district into the mainstream. Hence the opening of a CIMA information desk in Trincomalee and the announcement of opening a Business College in Trincomalee very shortly," he added.